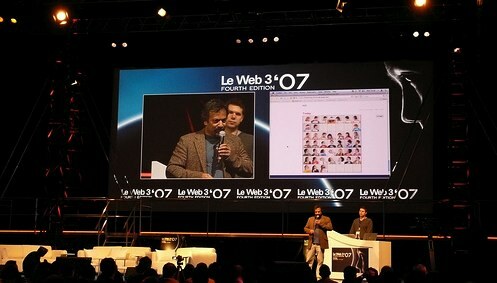 Last week the entire Osmosoft team visited Paris to attend the LeWeb3 conference. Initially, we had intended to be attending simply as delegates, but as time went by, we decided that we might be able to build something handy to use at the conference, and that perhaps, others might find it useful too. And so, RippeRap (then dubbed 'TiddleLeWeb') was conceived. We considered that building a tool based on TiddlyWiki where you could make notes on the conference and effortlessly share those notes with others, while being shielded from network hiccups, would be cool. To be ready, we had much to do, and little time to do it. We found that getting up-to-date and accurate information about the agenda from the LeWeb3 website, was a little fiddly, so including an agenda and using it as the basic navigation in RippleRap seemed like a natural choice. For added value, we also used Microformats to markup the agenda so that you could export the sessions to your calendar and so on. Since we were planning to hand out copies of RippleRap to other delegates, we decided to have a stand at the conference so that we could explain what we were doing with RippleRap, and in the open source world. Osmosoft and BT shared a stand which was busy throughout. I think that having Paul Downey around to talk people through his excellent, and popular uber-doodle, 'The Web Is Agreement' (more than 60 thousand views on flickr at time of writing) helped draw people to the stand. I rather think that the retro-chic bat phone also raised a smile. We enabled every copy of RippleRap to make free calls to the bat phone at the stand in order to get support. Building that feature was made easy with Mojo, BT's REST exposure to its 21cSDK. RippleRap was distributed with the mantra 'release early, release often' ringing in our ears. There is no arguing with the suggestion that this is an application in it's early days. Releasing software in this way has been something of a revelation to me. I'm used to a more traditional release cycle, where you possessively guard your work until you are good and ready to face the scrutiny. As I attend more conferences like this, I hear 'release early, release often' more and more regularly, and it is always met with lots of enthusiastic head nodding from around the room. There has been a lot of feedback and we are finding it all valuable. Hopefully, the next release of RippleRap will have some of the useful improvements that were suggested. There were a couple of things about LeWeb3 that I did find a little irksome though (aside from the absurd name - this is not the third year of the LeWeb conference, the 3 refers to web 3.0!). I found that the time allocation for the various speakers was a bit odd at times. It seemed that some panel discussions that featured Loic Le Meur (organiser of LeWeb3) went on for a very long time, and I found them, to be blunt, a little self indulgent. This is all well and good except that several other speakers had their time trimmed to ridiculously short slots. Notably, Doc Searls, who I was particularly looking forward to listening to, had to rush through his presentation at lightening speed and was told that he didn't have time to take questions. Booo. I was also really disappointed at the handling of some of the questions from the auditorium by Loic. At times I found him rather rude in the way he dealt with those asking questions, especially if the questions were in any way challenging to the panel. Perhaps Mr Le Meur was just trying to take care of his speakers by shielding them from any potential awkwardness on stage, and the rudeness was just a artefact of a slight language barrier, but I suspect not. The facilities at LeWeb3 were very good. I had reservations about the conference being split into 3 separate buildings, but this was not actually a problem. The staging and audiovisuals where outstanding. The food was superb and the provision of power on every row of the main auditorium was very welcome. I am led to believe that a significant amount of money had been spent on providing free wifi, but sadly the wifi was rather unreliable - but hey, that's what you get at conferences, and why a tool like RippleRap might be a handy thing to have at your fingertips. 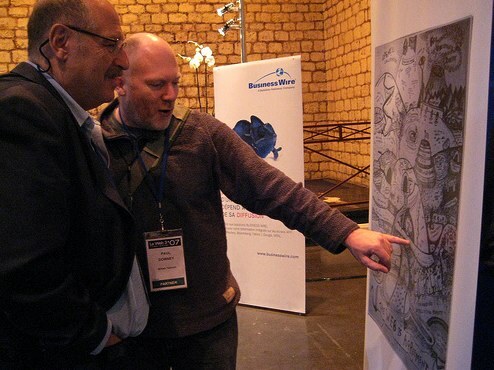 Check out the photos that Osmosoft took at LeWeb3. Several Osmosoftians more talented than I have posted pictures at flickr.